Our speaker was Jerry Stone who runs the Spaceflight UK website but is also an author and renown expert on spaceflight. He came to talk to us about "The Day They Launched a Woodpecker" but he did allay our fears about the fate of the bird saying it did not actually come to any harm. Jerry introduced himself by saying he was proud to have been given a Blue Peter badge and over the past 50 years he had given talks both in the UK and abroad, having started at the age of twelve. He had worked at Northgate Information Services but when the company's building was destroyed by an oil storage facility exploding in 2005 he decided to change career and work full-time as an author and educator. He began by explaining the story behind the "launching" of a woodpecker. 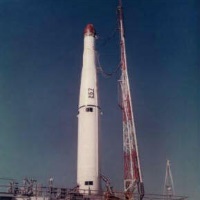 Some rocket scientists back in the 1960s were attempting to launch a Thor-Ablestar rocket with a satellite payload when data from the satellite suddenly stopped. The launch was aborted so that they could try and find out what the problem was. They traced the failure to holes in an umbilical cable from the launch tower to the satellite and so they replaced the cable and tried again. However the fault reoccurred and further investigation revealed that a red-bellied woodpecker had pecked the holes and had even begun building a nest nearby. They tried scaring the bird off with horns and bells and when that failed they even tried to electrocute it. What actually worked was blasting the nest with compressed air, sending the startled bird down range on a rather faster flight path than it had previously experienced. He added that this event is immortalised on Cape Canaveral launch pads, which alongside rocket silhouettes recording a tally of successful launches now have an accompanying woodpecker icon. Whilst Jerry led us through the history of early rocketry, his extensive research had uncovered numerous interesting and humorous facts making his talk very unique. For example, in World War 2 scientists working on the V1 rocket received a puzzling letter that asked what happened to the million building bricks they had asked for. As they had never ordered such a consignment but knew it did not pay to contradict the High Command they replied by saying that the bricks were lost in a typhoon. Despite this reply being ridiculous, as the rocket site was far inland, the High Command realised the accounting error and admitted it but rather amusingly added "typhoon not necessary". Later on in US space projects this humour was repeated when anything that went missing was blamed on the aftermath of a typhoon. Other interesting anecdotes he mentioned were that Alan Shephard, the first American in space, received a mere 14 dollars flight pay for his record-breaking achievement. Then there was the time that engineers installed gyroscopes upside down in a captured V2 rocket in 1947. When they launched it from the White Sands Proving Ground in New Mexico, instead of it flying north it went south and ended up in Mexico. Luckily, it crashed in an uninhabited area three miles south of the city of Juárez.